As a doctoral student in engineering at the University of California, Riverside, Ian Marcus build a human colon – not as an art installation like "Cloaca" by Belgian artist Wim Delvoye, but a science project. The intent was to study bacteria (E. Coli, in this case) within more natural conditions rather than the typically isolated environment of the lab. 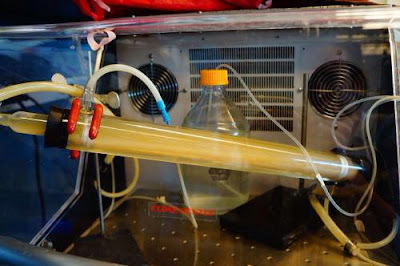 He found that as the pathogen passes from colon to water treatment plant to groundwater, it is able to live longer and travel farther because of the interactions within the microbial communities. His work has been praised for his novel approach to studying the biological contamination of water, but Marcus describes, "People would give a kind-of-interested-but-definitely-don't-talk-about-it-during-dinner look because we're literally dealing with crap. It has got the smell. It has got everything."